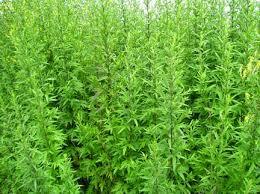 Mugwort is an ancient plant used in traditional European and Asian medicine. It is best known for its actions as an aromatic bitter, which increases digestion and enhances nutrition by stimulating digestive and bile secretion. It helps to relieve gas, ease cramps, increase the appetite and cleanse the bowels. Mugwort is also associated with women and menstruation. It increases circulation to warm up the uterus and pelvic region, move the blood, remove stagnant blood (the source of cramps, stiffness and pain) and regulate hormone levels. Some use it as a general menstrual cramp regulator (particularly for congestive cramps with symptoms of feeling heavy, thick, pain in the lower back and general stagnancy) or for violent cramps. Mugwort is mildly stimulating to the nervous system, reducing tension and increasing circulation and nutrition in the nerves and muscles. In Chinese medicine, fibers from mugwort leaf are rolled into moxa sticks and burned as moxibustion. The sticks are placed over cold, stiff joints to increase warmth and circulation. Applied closer to the skin, the sticks are used to cause blistering and burning todraw blood to the surface of the skin and to draw toxins out of the connective tissue in the joints. Applied further away, the area of the body warmed draws blood into the connective tissue to strengthen the joints. Mugwort can cause an allergic reaction to those with sensitivities to plants in the Asteraceae family. It should not be used during pregnancy as it stimulates the uterus. Dry the herb by hanging or in a dehydrator. To make an infusion of the dried herb, pour 1 cup of boiling water over 1-2 teaspoons and infuse covered for 10-15 minutes. Drink three times a day. To make a tincture, place your dried mugwort tightly in a jar and cover by one inch with 100 proof vodka. Allow to sit for a month, shaking occasionally. Strain through muslin. Use 1/2-2ml, 3 times a day. Mugwort can also be made into an oil to use topical for stagnant or stiff areas that need a little coaxing, such as tight muscles or the menstrual system. The oil applied topically on the skin above the female reproductive area will help gently stimulate movement. Mugwort is high in calcium and magnesium and can be combined with other nutritive spring herbs for a nourishing mineral and vitamin vinegar to use on salads or as an addition to cooked foods. Place herbs such as mugwort, nettle, chickweed, dandelion leaf, parsley, plantain and horsetail in a jar and cover with apple cider vinegar. Let steep for a month, strain and enjoy. If using a metal lid on a mason jar, place a piece of wax paper in between jar and lid to prevent corrosion from the vinegar. Dry the top 8” of mugwort until they are almost completely dry. When they are still flexible, make bundles about 1” thick with the stem ends together. Starting at the stem end, wind cotton thread in a spiral around the bundle to the tip of the bundle and back again. Tie the end and allow the bundle to dry completely. To use, light the non-stem end with a match and wave in a circular motion as you move around a room or a person. This is thought to clear negative and stuck energy from a place or person while also calming and protecting the space. Mugwort is known as a powerful dream herb, encouraging more vivid dreams. Simply hang some dry mugwort by your bed or make a dream pillow by blending together mugwort, lavender, chamomile, and any other soothing herb and wrapping them inside a cloth to put by your pillow to encourage relaxing sleep and dream time. Cautions/Contraindications: May cause allergic reactions to those with sensitivity to the Asteraceae family. Take caution during pregnancy and with heavy menstrual flow as Mugwort is a powerful mover.